Just as certain lighting can keep you focused, too bright of light can make it uncomfortable. Have you ever been around fluorescent lighting? I don’t know about you, but it bothers me, and I certainly wouldn’t be able to focus for long. That’s why I am so excited that I received the Philips Hue White Ambiance Light Recipe Kit. This kit is so awesome! It comes with a dimmer switch so that you can control how bright the lighting is. You can use certain light settings depending on what you need to get done. Do you want to relax? Use the relax setting. The Hue Light Recipe Kit can be set to certain lighting, and if you choose to go back to that same setting, all you have to do is go back to the “on” button. I’m getting ahead of myself. The kit is ready to go right after taking it out of the box. No setting up, no cords or plugs. It comes with a light bulb and the remote switch. It is seriously that simple. You screw the bulb into any light outlet and use the remote. However, that is just the beginning! So using the Hue remote, you can cycle it through different colors and brightness of lighting. The light settings are called relax, reading, concentrate, and energize. You can probably guess how bright each one is. As if that isn’t enough, you can customize the cycle feature through the Hue app. 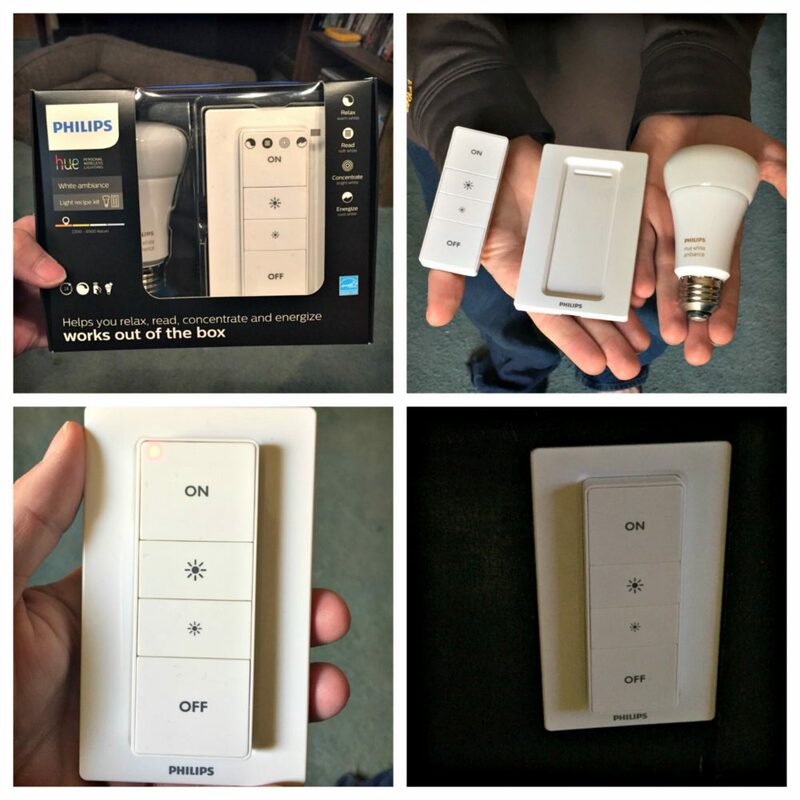 You can also sync up to 10 white ambiance lights with your Hue dimmer switch. Now…you would think that is all it could do, but you would be very wrong! Philips Hue now has something called the Hue Bridge. This cool thing will let you configure 50 Philips Hue lights and you can control all of it by using your Alexa, Apple Homekit, or Google Assistant. Now that would be a party! I’m very happy with my one light bulb and my dimmer switch, but if you are interested in adding more lighting, they have you covered. It is impressive how easy it is to use. My son has a strange set up in his room, so when I received this, he was very happy! Now when he goes to sleep at night, he just uses the remote (dimmer switch) and simply turns it on when he wakes up. He keeps telling me to say how happy he is with it. Needless to say, we will be using this every single day. Oh, and if you are afraid of losing the remote, you can mount it on any wall using adhesive tape or screws.